It’s no secret that tons of people are nearing the age at which they’d like to retire and simply can’t do it. When they run retirement projections themselves or with a financial planner the numbers just don’t work. The projections are showing them outliving their money and being forced to live solely on social security. It’s not the ideal situation, especially if you’re not in a job or career that you particularly enjoy. But by sacrificing a year or two of more work you can ensure yourself a much more enjoyable retirement. Let’s examine a case study to determine how effective working just one more year has on a couple’s retirement projections. Mark and Susan end up depleting their 401(k) balance at age 92 and will be forced to live solely on social security for the remainder of their lives. Of course, this is assuming we are 100% correct on all our assumptions, which won’t be the case. A 6% growth rate in their 401(k), a 3% annual increase to social security and their expenses, and the fact that they both live at least to age 93 or longer. Numerous things could happen to throw off these projections. Abnormal investment returns in either direction, an early death for one or both spouses, or really high inflation or an extended period of deflation. The point is, doing the best we can on our projections, it seems that not outliving their money will be a close call. If Mark and Susan decide to work just one more year and retire at age 66 instead of 65 it’s incredible how different their projections look. Let’s re-cap the four benefits that occur by working longer and how they specifically benefit Mark and Susan’s situation. Instead of funding 30 years of retirement, Mark and Susan will only be funding 29 years of retirement. In Mark and Susan’s case let’s assume they make a joint income of $215,000. A very realistic number considering they’ve both worked the majority of their lives. Mark earns $150,000 and Susan earns $65,000. With good incomes, no debt, and no dependents to take care of Mark and Susan have the capacity to both max out their 401(k)s at $24,000 apiece. In addition they both receive an employer match of 5% that vests immediately. Assuming a 6% growth rate, this increases their combined 401(k) balances by $122,275. Since social security benefits are based on the top 35 years of earnings adjusted for inflation, Mark and Susan will be replacing one of their lower earnings years with this additional year of earnings. This will slightly increase their retirement benefit. However, they will receive a larger bump because they can afford to hold off on taking social security for one extra year. In this case they each get a 6.67% increase in their benefit for waiting until full retirement age. 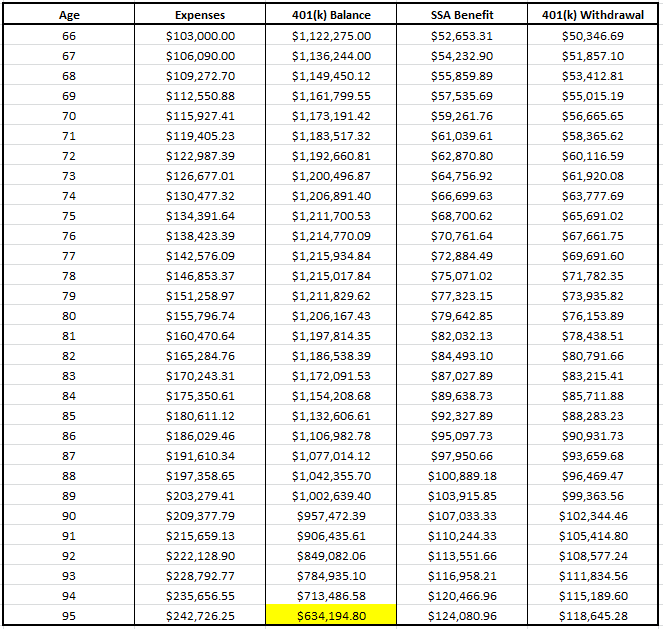 The higher earning year plus waiting until full retirement age to take benefits increases their total combined annual benefit by $3,165. Although these changes may seem small it makes a significant difference in their projections. By waiting one extra year to retire Mark and Susan are able to begin retirement with a higher 401(k) balance and social security benefit. This results in them taking less from their 401(k) each year which allows compound growth to work its magic. It all combines to give them some cushion in their retirement planning and projections. 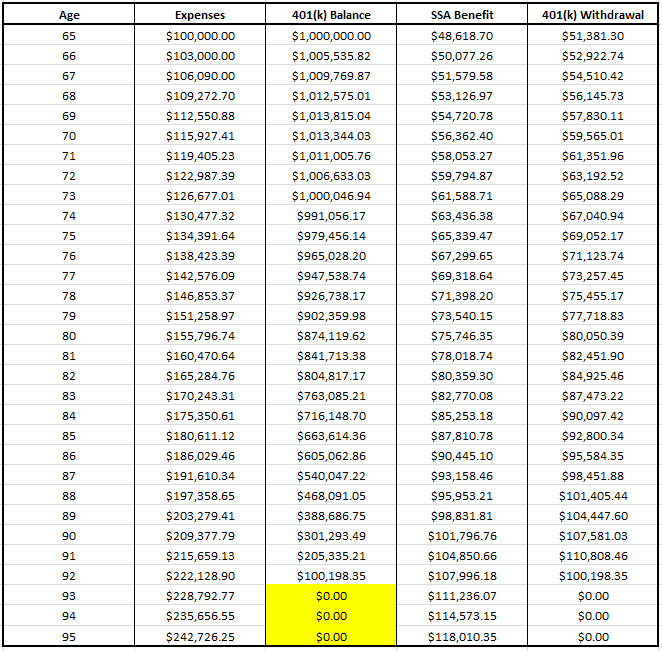 These new projections show them dying at age 95 with a balance of $634,194 in their 401(k)s.
Keep in mind this is just a case study, every situation is different and so will be the effect of working longer. However, the point is, working even one year longer has multiple benefits on the longevity of your retirement capital and should be something you consider if you find yourself not fully prepared to retire at your desired age.